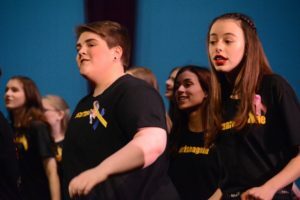 Broadway Night 2019: Revivals – Advanced Tickets On Sale! Buy tickets online at BWN Tickets now and save money! Show Your Support for Broadway Night! Do you know of a business that may be interested in supporting Broadway Night with a program ad? Or would you be interested in supporting your performer with ¼-page Shout-Out-Ad or One-Liner? You can learn more about program advertising, buy and prepare your artwork at BWN Program-ads. Fund Raise with Scrip for the NY trip! For detailed information about the ordering process, go to: Scrip Info Page. We will place the next January orders for physical gift cards and check orders on 1/25. The earnings cut-off for the NY trip is at noon on 1/25/19! Subsequent earnings will go towards future trips. We are urgently seeking a detail-oriented and organized individual to lead the Scrip program. Thus, if you are interested in volunteering for this position, please email Susan Sather at president@southlakeschorus.org ASAP. If you have not done so, we need your payment ASAP. Pay via My School Bucks (preferred method) or send in a check to Ms Gigliotti/Ms McCormick with “chorus spring trip” on the memo line. We are working out backup space options to keep rehearsals moving in the case that FCPS facilities are closed. If anyone has contacts to possible facilities, especially for the Good Shepherd Church (we have used in the past,) please email broadwaynight@southlakeschorus.org. Although we are updating detailed rehearsal schedule for next week, please note that the BWN Rehearsal Schedule Online is not finalized. There will be changes to the schedule based on progress and scheduling conflicts. Please check in with your performers to see what they need for their costumes, because they should bring items to rehearsal as soon as they have gathered pieces. They will then need to check in with the directors and get approval. The goal is to get all costumes ready by Monday, January 21st! At this point, students should have as much of their music memorized as possible. We are still adjusting a few of the tracks due to key changes. So, please be patient as we work through this. Meal Lead: help oversee the volunteers, and the order, pickup, setup, and clean-up of meals. Security: help coordinate volunteers for “security” of the performances – tell individuals where to be stationed, how to monitor noise, etc. Concessions: lead the concession effort – organize volunteer shifts, ensure items are purchased, maintain the inventory and sales for the three shows. One Liners On Sale Now! Purchase BWN Shout-outs one liner for your performer, which we will print in the BWN program! Deadline is January 22nd, so do it today!